1974 - Priekuļi Agriculture Techincal School. 1980 - Faculty of Mechanization of Farming, the Latvian Academy of Agriculture (now – Latvia University of Agriculture). 1980 - 1990 - Chief engineer of Jelgava district collective farm “Avangards”. 1990 - 1997 - Chairman of the Jelgava District Council. 1991 - Member of the Council of Latvia’s Popular Front. May, 1997 - Elected by the congress as Vice-chairman of the Union of Local and Regional Governments of Latvia. August, 1997 - Approved as the Minister of Agriculture in The Cabinet of Ministers administered by Guntars Krasts. March, 1998 - Elected in the Board of the Latvian Framers’ Union. October, 1998 - Stood as a candidate from the Latvian Framers’ Union in elections for the 7th Saeima. December, 1998 - Advisor to the Prime Minister. January, 1999 - Governor of Jelgava branch of “Unibanka” bank. March, 1999 - Advisor to the Minister of Agriculture. March, 2001 - Stood as a candidate from the Latvian Farmers’ Union for the Jelgava self-government elections. Was elected the Chairman of the Jelgava self-government. 2003 - Member of the Executive committee of the Latvian Olympic Committee. March, 2005 - Was elected the Chairman of the Jelgava self-government for the second time. President of the nongovernmental organization “Duke Jacob’s club” - the Club that unites entrepreneurs of Jelgava. Since 2007 - Member of Council of Latvian Chamber of Commerce and Industry. September, 2007 – Was elected Council Chairman of Society Unity Foundation. July, 2009 - Was elected the Chairman of the Jelgava self-government for the third time. July, 2009 - Became the president of Latvian Large Cities Association. August, 2009 - Elected Deputy to Chairman of Latvian Association of Local and Regional Governments. January, 2013 - became vice-president of the Latvian Volleyball Federation. 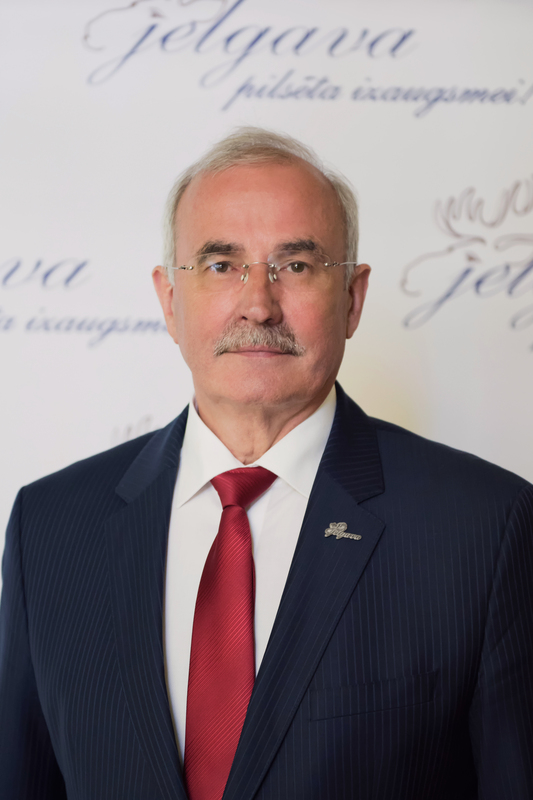 June 2013 - Was elected the Chairman of the Jelgava self-government for the fourth time. July, 2017 - Was elected the Chairman of the Jelgava municipality for the fifth time.